20 November 2003 ... Recognized! They gave me an award today at work! 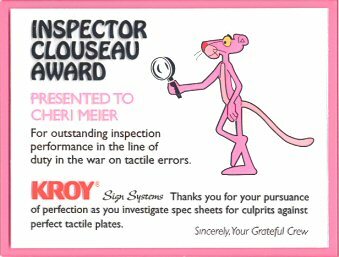 It's the First Annual Pink Panther Award. Well, it's not really called that, and I don't know if it's annual. But it _is_ the First! And Only! I filled mine out extensively. My work partner, L, joked that I wrote a book. ha. Well, hey, I have things to say and writing is how I usually say them. Plus, it gave me a chance to spread my propaganda... I filled the back of one page with recycling ideas! We already recycle coke cans, corrugated cardboard, film negatives, and acrylic (ie plastic). I wondered if we could recycle the masking materials since we go through a lot. And mentioned giving everyone a coffee mug so we could quit buying the evil styrofoam cups. When big boss mentioned that last bit, everyone groaned. No one wants to wash their damn coffee cup. Someone spoke up and asked for a dish washing machine. heh. Then somebody else wanted a cappuccino machine. Then someone asked for a Starbucks. So, probably nothing will be done about the styrofoam. Which annoys me. And then big boss introduces this new award thingee. I'm just thinking, "Please, not me." And then he's talking about the person who's about to get the award. And it's definitely me but I'm still, "Please, not me!" And then he says my name. The response from the rest of the mere mortals, aka my coworkers, is mixed. Which is the reason for the Please Not Me. Some people congratulated me. Some people ignored me like they always do. One joked, "You work for a sign company and your reward is a sign!" heh. Another was scoffing the plaque, saying they should give me 100$. heh. And my work partner, L, is not the kind of person who is happy at other people's success... she won't be talking to me for a while, I suppose. Shrug, I respect her feelings and won't be bothering her about it. But in the end, I know I do deserve my recognition. I give them my best, and my best is pretty darn good. And it has been noticed by everyone, I think. But you already knew I was cool, huh.